Refugees trying to immigrate have a new friend, and it's a robot. When Joshua Browder developed the chatbot for DoNotPay, the original idea was just to help people out with their traffic ticket woes. DoNotPay has since successfully overturned more than 200,000 disputable parking tickets in London, New York, and Seattle. It’s also given free legal aid to people who couldn’t afford lawyers for their emergency housing issues. The 20-year old Browder, a student at Stanford University, has now turned his robot lawyer to helping refugees seeking asylum. The chatbot was a product of more than six months of hard work, as Browder had to work with various lawyers to train his artificially intelligent (AI) chatbot. “I wanted to make sure I got it right because it’s such a complicated issue,” Browder told The Guardian. “I kept showing it to lawyers throughout the process and I’d go back and tweak it. That took months and months of work, but we wanted to make sure it was right.” Now, it helps refugees fill out immigration applications to the U.S. and Canada, while it offers assistance for asylum support in the U.K. Instead of refugees filing out applications themselves, they simply chat with this robot lawyer. Everything is done in plain English. “The language in these forms can be quite complicated,” Browder said. 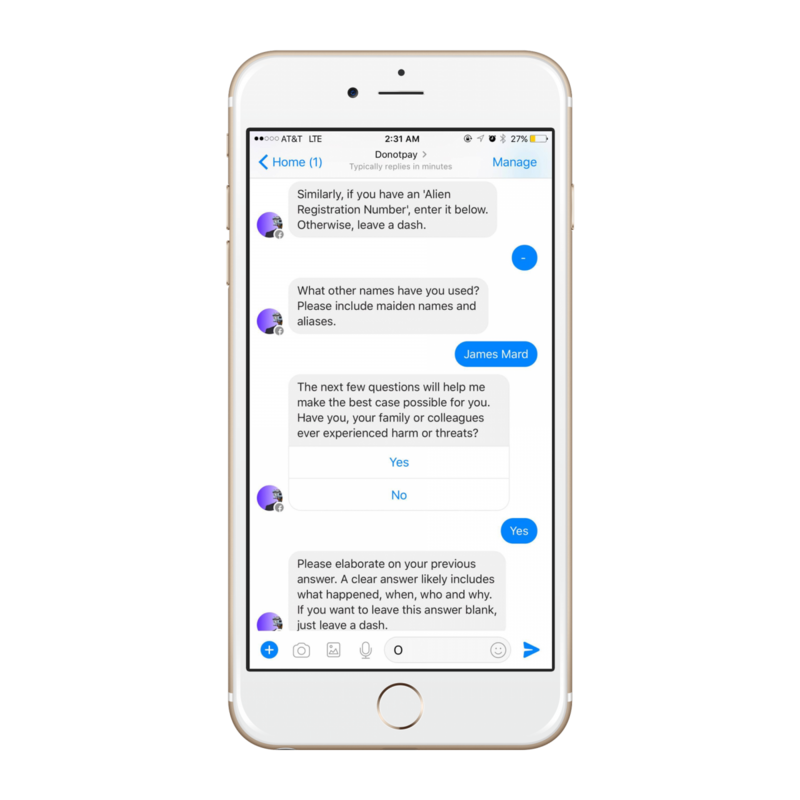 The chatbot determines which information it needs to fill out applications by asking a series of questions. “Once the form is sent off, the details are deleted from my end,” said Browder. For his chatbot’s new platform, Browder opted for Facebook Messenger. “It works with almost every device, making it accessible to over a billion people,” he said. While Messenger may not have end-to-end encryption, Browder keeps everything encrypted between Facebook and his server. “Ideally I would love to expand to WhatsApp when their platform opens up, particularly because it’s popular internationally,” Browder added. This has always been the point behind Browder’s work. In working on parking ticket disputes through the original DoNotPay, he has helped simplify the all-too-often complicated legal language. “Asylum seekers want to follow the laws and do everything properly, and this technology will help them do so,” Alcorn added. Browder’s chatbot also demonstrates how AI can greatly improve our lives. This chatbot isn’t the first AI to dabble in law. There’s IBM Watson’s robot lawyer named Ross, and the AI lawyer that reviewed human rights cases in Europe. But what Browder’s work has added is a unique, simplified interface that most people can relate to. Everyone who has access to the internet and Facebook Messenger can easily avail themselves of its services.